These Banoffee Cupcakes are a fusion of banana split and banoffee pie. Dark chocolate chunks and a hidden banana flavoured dulce de leche filling. Topped off with banana flavoured cream cheese frosting. I hope you said yes then because I’ve missed each and every one of you. As I said on Sunday’s link party, (which is still open. Go submit, do it now) I’ve been ill. Thanks to those of you who wished me well. I’m feeling tons better – yay for painkillers! Crappy frosting swirls! I didn’t chill the frosting first. BIG mistake! Can you believe January is almost over? When did that happen? Why has it gone too fast? To be honest, and I don’t know why, things have been epically busy for me since Christmas. As we all did, I took time out from blogging over the Christmas and New Year period and I still haven’t been able to get back into the swing of things since then. To turn your hatred of me and my suckiness to love, I bring you cupcakes. Not just any type of cupcake but Banoffee Cupcakes. These Banoffee Cupcakes are a fusion of a banana split and banoffee pie. A delicious combo of vanilla sponge with dark chocolate chunks and an amazing banana flavoured dulce de leche filling. Topped off with banana cream cheese frosting. Instagram – During the making ‘hacking’! To make the cupcakes, preheat the oven to 175°C/345°F/Gas Mark 4. Place cupcake cases into the muffin tray. Add the butter, sugar, salt and vanilla into a mixing bowl and cream together until pale and fluffy around 5-minutes. Beat the eggs in another bowl and slowly add to the butter mixture while whisking quickly. If the mixture starts to separate or curdle, add in 2-3 tbsp of flour to rebind. Once all the egg has been incorporated, add the remaining sifted flour and stir until the batter is just combined. Fold in the chopped chocolate (or chocolate chips) using a rubber spatula. Spoon or pipe the batter into the cupcake cases until ⅔ full only. Bake for 12-15 minutes until the cupcakes are a golden brown colour and spring back to the touch and/or when a skewer inserted comes out clean. Allow the cupcakes to cool in their tray before turning out to cool completely. Once cool, wrap the cupcakes in plastic wrap and chill for 1 hour or until the sponge feels firm to the touch. 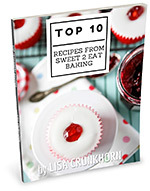 Using a melon baller, cupcake corer (or a teaspoon, in my case), scoop out the tops of each cupcake. Set aside. To make the banana flavoured dulce de leche frosting, Using a fork, mash the ripe banana and then mix it together with the dulce de leche. Spoon or pipe the dulce de leche to fill the scooped-out holes of the cupcakes. To make the banana cream cheese frosting, add the cream cheese into a mixing bowl and beat until smooth and creamy. Place the butter and icing (confectioners’) sugar into a separate bowl and cream together until very pale and fluffy. Once set, using a large plain round piping tip, pipe a swirl onto each cupcake. You are not sucky and I never stopped loving you! But these cupcakes don’t hurt 😉 OMG I loooove them! I’m sorry you’ve been sick. 🙁 But these cupcakes are fabulous Lisa!! Just give me a piping bag full of the dulce de leche and let me go to down! Actually the whole cupcake looks incredible and I love the photography. Thanks for sharing! Lisa these photos cannot be legal. They are mouth watering!!!! You don’t know what you’re doing to me. I want to grab one cupcake right now! You can take the time you need Lisa, if you come back with these cupcakes! No seriously, I hope you´re feeling better! These little cakes are amazing! Oh my GOODNESS!!! These cupcakes look absolutely amazing! I am loving that banana dulce de leche filling and chocolate chunks. Holy cow, I seriously need these in my life. NO I cannot believe January is almost over!! Seriously time… slow down! I desperately need a cupcake in my life like this right now. Work has been daunting so far this week! And I truly hope you are feeling better dear Lisa! Oh my goodness, they look delicious!! Now these are seriously some fab cupcakes!!! Nice! I want one of these right now!! These look incredible! You, my friend, are inspiration in a box–I hope you feel loads better! I’ve been in bed with the flu all week, so I totally feel you on that score; not being able to step in the kitchen and look at food for more than 5 seconds without wanting to hurl is *not* conducive to happy campers around the house. These sound like a *delightful* recovery treat though! I hope your starting to feel better. It’s going around. These look wonderful. OMG LISA. These cupcakes are awesome! Banana flavored dulce de leche? Is this real? I could eat that alone with a spoon! And when I come to England (which I hope is soon but ya never know), I need to try this Banoffee Pie. It sounds INCREDIBLE! These cupcakes look and sound lovely! Glad to hear you are feeling better! These cupcakes are absolutely drool worthy. Hope you’re feeling better now. Thanks for sharing! Sorry you have been so sick, a lot of people in TN have had the flu. Your cupcakes look delicious ! ! Gorgeous pictures. I made these banoffee cupcakes for the super bowl party and it was a crowd favorite. I’m also gonna pin this post on my Pinterest board my followers will love it. Thanks for sharing, Lisa! Definitely, your banoffee cupcakes are awesomeness! This is a great recipe Lisa, as you know I made it a short while ago and it was lovely, in fact, have made it again since. Thanks for sharing!